I have implemented the below example to show the multiple base layers of map in my application using LeafletJs. I'm able to successfully implement the same but I'm trying to show same in a single tile image option. 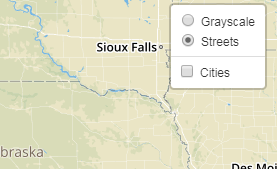 So that when the user clicks on the small map icon, it should change the view to the other Layer. As in my case there will always be only two layer. I have tried to add the pane option but that doesn't seem to be the right option for this behavior. Also I have tried some of the properties mentioned in the below link. Is this feasible with the existing components of Leaflet? Browse other questions tagged leaflet maps leaflet-draw or ask your own question. How do I add custom CSS class to an image overlayer in Leaflet?